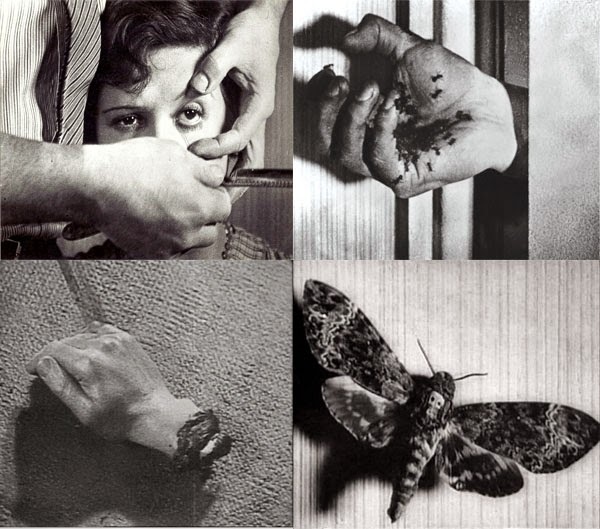 One of the most well known (and notorious) short films of all time, Un Chien Andalou is a surrealist experiment with the structure of cinema and its ability to deliver a unique type of imagery. It drops us in a world where a boy wants a girl but can't have her because to get to her he has to drag two pianos laden with donkey carcasses and confused priests, so the question of what objective meaning can be derived from it is obviously a difficult one. Do the priests represent the restrictions of religion? Do the dead animals symbolize the weight of bestial emotionalism in contrast to the cerebral artistry of the pianos? There are a few recurring themes (anxieties about sexuality and mortality find themselves represented by the visions of bodily penetration and dismemberment contrasted with the lust of the man's molestation), but there's never anything that tells us what to make of them. There's a high bar to entry, but the film rewards any amount of investment we're willing to make in it. We bring to it what meaning we want, and as such it can be a lead to a wide variety of different viewing experiences. 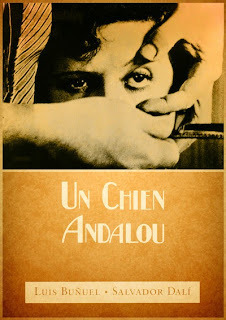 Beyond its potential for subjective interpretation, however, Un Chien Andalou does offer a few objective points of interest. What little narrative there is can basically be boiled down to a couple of lovers who have a series of encounters with a mysterious box (for this reason it's easy to see a connection to Lynch's work, particularly Mulholland Drive with its mysterious blue box). The box is essentially a (thematic) MacGuffin since it contains just about whatever meaning you want it to (at one point it does contain a new tie, for whatever that's worth). Each encounter with the box alters the couple's course through the story. Perhaps the most important objective element of the film is its experimentation with editing methods. There are a variety of techniques which are still easily recognizable today (shot reverse-shot for a character's perspective, dissolves for temporal transitions, etc. ), and these moments are fairly easy to "read" (we understand that she's looking at the moth on the wall even if we don't know why or what it means). But what are even more relevant for the history of film are the free association edits between images. There's a sequence which dissolves from a hand with ants coming out of it to a hairy armpit and finally to a spiky sea urchin. Before the infamous eye slicing, there's also a shot of the moon being "sliced" by a cloud, which foreshadows the action. What these shots mean isn't a question I'm prepared to answer, but they're certainly a fascinating experiment in montage. Un Chien Andalou has no doubt endured partially because of its enigmatic nature, but whether you find analyzing its imagery interesting or not, it's an important experiment in early cinema which lives on in the inspiration it caused in other filmmakers. Is the ending hilarious to anybody else? From what I gather, the woman leaves the man she's been with and finds a new lover, then we see an intertitle which says "in Spring" and we cut to the new couple buried in the sand, as if springtime (the typical season for budding romance) has only buried them in more future troubles like the ones that preceded this moment in the film (i.e. she's only going to have her eyeball cut all over again). Ah, young love!